steak | Have YOU Ben Starr Struck? So as you know, I’ve been back from Burning Man for nearly a week, but my travel schedule during that time got so hectic I had to stop blogging. I came home to a broken air conditioner, miscellaneous plumbing crises, and a catering event, so I’m JUST now starting to come up for air and get the rest of the journey chronicled. Because…what a journey it was! We leave the wonders of the Grand Canyon and Flagstaff for Vegas. Normally I do everything in my power to avoid Las Vegas in my travels, but we need a cheap hotel room where we can dye our hair, and Ross has never seen Vegas before, and I always take a bit of perverse pleasure in seeing a rational human encounter this city that represents the worst of our culture. 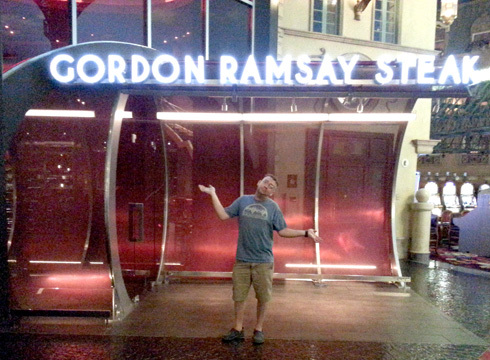 One of these days, Gordon, I will eat at one of your restaurants! I’m actually VERY eager to eat at a Ramsay location. I don’t get upset about dramatically overpriced food if the quality of the ingredients is excellent and the execution and service are flawless. I am potently eager to have the GR dining experience to see if it lives up to the hype! Maybe next time, Gordon. After a whirlwind tour of the strip, so Ross can gawk at the stunning architecture and witness the stupendous excess of this city that has no right to exist in the desert, sucking up precious water and electricity so that people can empty their pockets into slot machines and watch over-priced shows, we head back to the hotel room for a Burning Man ritual…the hair dye. Those little symbols represent “The Man,” which is symbol of the whole event. And in the week or so before Burning Man takes place, you start seeing this on cars, moving vans, 18-wheelers, RVs, campers, bicycles, and backpacks all across the country…on interstates and backroads…as 65,000 people begin their journey “home.” After you’ve been to the event a time or two, you actually do start thinking of it as home. You have a family there…maybe it’s a family you only see once a year, but they are like family to you. It’s the place where society functions as it’s SUPPOSED to. With everyone sharing selflessly, loving and accepting everyone for exactly who they are. No one is naive enough to think that Burning Man could exist all year. But one week of Utopia is better than what most folks get in a year. So people come to think of Burning Man as home, and as I start seeing the symbol on vehicles on the road around me and at gas stations, I start to get misty eyed. Another great thing is that you can walk up to ANYONE with this symbol on their car, give them a huge hug, and they are instantly a friend. Eager to help with whatever you need. Even though you’ve never met them. Northwesterly we drive, into the bleak, barren deserts of Nevada. We pass the site where the country was going to store its nuclear waste…way out in the middle of nowhere on Yucca Mountain. We pass a rock on which is painted, “Shady Lady brothel – 23 miles.” Prostitution is legal and regulated in a few counties in Nevada, but it’s still very bizarre to see this sign…way out in the middle of nowhere. 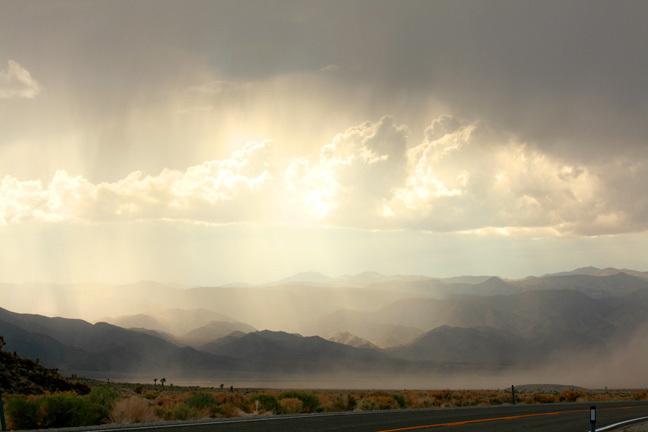 A monsoon storm is sweeping the edge of the White Mountains where they descend to the Mojave desert, kicking up a vast dust storm and bathing each mountain in a different light. We pull over and stare, mouths open. Ross climbs a nearby hill and begins photographing next to a Joshua tree. The entire scene changes, moment by moment. Thunder echoes off the distant peaks and rumbles across the valley, and I can feel it in my chest when it hits. We watch the storm for nearly an hour…it’s more captivating than any movie. Then we drive up into those mountains. And I do mean UP. Up, up, up, up, towing a heavy trailer behind us. My little car tugs like a champ, but eventually we have to leave the trailer on the side of the road because the grades are getting steeper and the curves sharper. 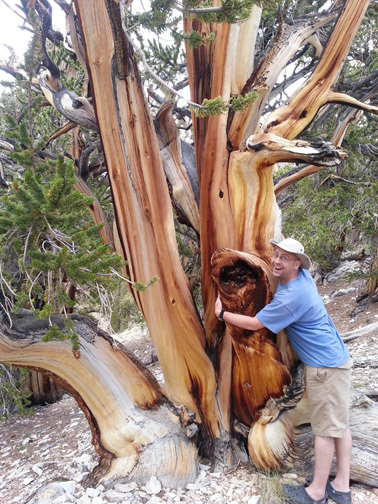 Until we top out above 10,000 feet in the Inyo National Forest, which protects the oldest trees on earth. The bristlecone pine trees grow only in the American Southwest at elevations above 10,000 feet…far higher than any other tree grows. They only grow on desert mountains that lie in the rain shadow of other mountain ranges, so these trees sip a mere 3 or 4 inches of rain each year. They grow slowly. Their wood is hard, and gets blasted by howling winds, eroding it into fantastic shapes. We’ve arrived at the Methuselah grove, in which are the 2 oldest trees on planet earth…over 5,000 years old. Looks like rain tonight! Only a hot spring can soak away the aches and grumbles of a damp night in a tent during the rain, so after a quick bite at a diner in Lone Pine, we head to the Keough hot ditch. Not a very appealing name, huh? In fact, the name alone kept me away from this hot spring for years, even though it’s less than a mile off Highway 395, which I drive every year to Burning Man. But a “hot ditch” just didn’t sound appealing to me. Still, I’m pulling a trailer this year, so I’m sort of relegated to the hot springs close to the highway, so we give Keough hot ditch a try. W-O-W!!! A river of crystal clear, naturally hot water dances out of the Sierras and cascades through pool after pool on its way down into the desert. This is no ditch…it’s paradise! Room for HUNDREDS of people to soak, should the hot spring ever be so unfortunate as to attract that many. We set up the tent well away from the hot river, so we don’t get disturbed by late night partiers, and spend an hour or two soaking our cares away as the moon rises over the distant White Mountains. We think about those amazing trees hiding up there, silently witnessing the march of human civilization. The partiers inevitably arrive, so we hit the sack, preferring to soak in the solitary hours of the early morning. After a quick morning soak, we head into Bishop, CA for breakfast. I LOVE Bishop. Actually, I love all the little historic frontier towns on the eastern slope of the Sierras. I could live there. In Bishop we stop at the Petite Pantry, a bizarrely named Sonoran restaurant serving up the best breakfast in the valley. 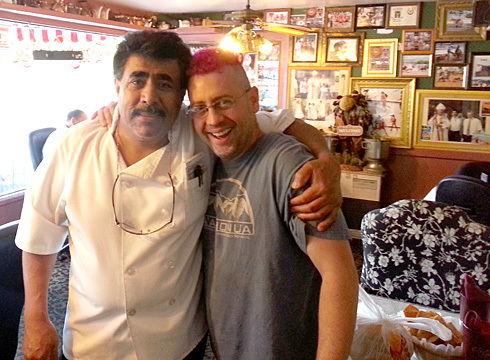 Jay, the owner, welcomes us and our weirdly-colored hair. Jay, it turns out, is not only the owner…he is the server…and the chef. 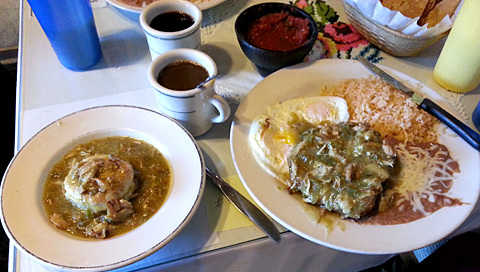 He brings us an extensive menu of Sonoran classics as well as American classics. And I get adventurous. Jay looks at me a little weird. Which isn’t weird, because I have pink hair. That’s a LOT of food. Some of the regulars wander over to see what it looks like…or what the person who ordered it looks like. I dive in. And it.is.d.i.v.i.n.e. But it’s a lot. And there’s no way I can eat it all. 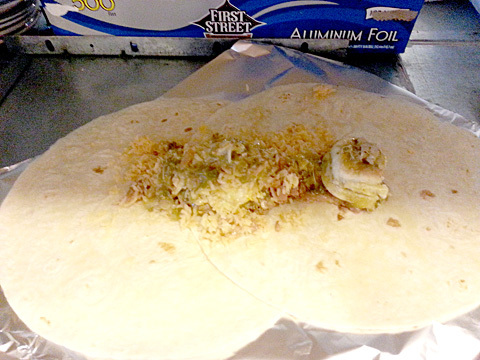 Jay is busy taking orders and cooking, so I figure I’ll save him some effort and dart into the kitchen for a to-go box, so I can wrap up my food. He slaps my hand just as I’m reaching for the box. He spreads out the two biggest flour tortillas I’ve seen in my entire life and invites me to scrape my plate clean onto the tortillas. 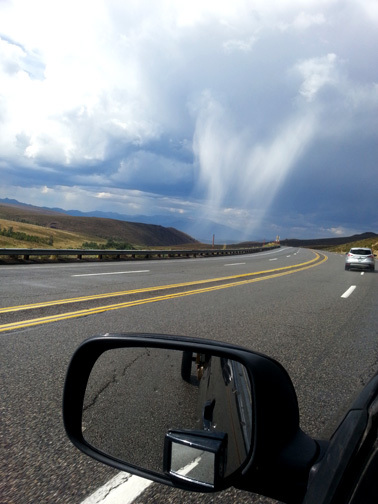 …and then he sends us on our way. This is a great story, of course, but it really is a distillation of what food means to me. Jay isn’t a trained chef. He’s making the foods his mother and grandmother made. But he is the master of his domain. He greets each guest the same way, whether they’ve been eating at his restaurant for 20 years, or whether they’re a weird pink-haired gringo wandering in from the desert hot springs. He COMMUNES with his guests, even from the kitchen window when he’s back there cooking up their order. Jay has found a way to do what I imagined I could never do, if I became the chef-owner of my own restaurant. I had nightmares of being stuck back in a kitchen, churning out the same food each night, never even able to see the faces of the people I was cooking for. 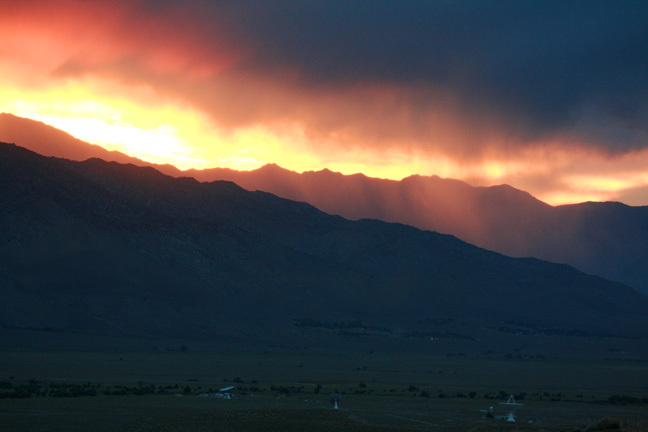 Jay, you have a magical place there in Bishop. You’re a lucky man. I know exactly how hard you work. And the smile on your face reveals exactly how much you love every minute of it. Dining at the Petite Pantry was a highlight of my entire 3 weeks. If you find yourself on Highway 395 east of the Sierras, DO NOT PASS UP Petite Pantry in Bishop. This lovely soaking pool is right on Highway 395, though most people drive right past it and have no idea it’s there. It’s the perfect place to rinse off after a Mono Lake swim. 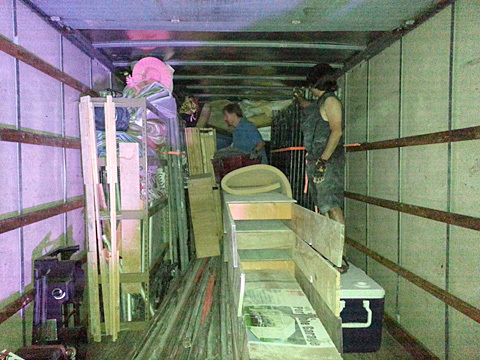 Tomorrow, all this stuff will be carted into the vast Black Rock desert and assembled into a home for 30 people. Camp Potluck. But now…sleep. Hello! It’s Michael Chen again. After talking to Ben, he told me that he would not be watching the last few episodes of MasterChef, so I took it upon my weary shoulders fingers to finish this season out for those of you that can’t live without the recaps. Expect a post from him in the somewhat near future about why he (and I most likely) will never watch MasterChef ever again. Quick recap to cover last week’s episode of MasterChef. I’ll try not to go too much into the drama, because that takes up too much of my time and I’m really over it at this point. I’ve had enough, am sick and tired of it, and probably won’t ever watch MasterChef again after this season unless I’m extremely drunk or bored. So we start off with another mystery box, and more sensationalist stuff about the prizes and how important they are. I wonder if the money that they display is actually real money, or “monopoly money”. The challenge is to recreate their initial audition dish that won them the apron in the first place. Natasha made Hanger steak with chimichurri and empanadas. Luca has his broccoli rabe ravioli with parmigiano-reggiano sauce, and Jessie made the sea bass en croute. It seems like an odd challenge to me that has more of a novelty factor than anything else. If the initial dishes were already so good and “masterchef quality”, how much can they do to really make it better? As always, please let me know what you think in the comments down below. One more to go! So we’re back up to 7 contestants, now that Bri is back. And it’s time for a mystery box. Krissi tells us, “I need to step up my game to a whole nother level.” I just HAVE to pause here to correct what is probably the most rampant abuse of the English language in modern American culture. And, yes, Krissi…I’m guilty of using it, too. There’s no such word as “nother.” That word doesn’t exist. Yet, I’ve even seen “a whole nother” on a bulletin board on I-35 near downtown Dallas. I’m not sure who the first person was who uttered “a whole nother,” but if I met him, I’d strangle him with my bare hands. Or at least give him a tongue lashing. Beneath the mystery box is one of my favorite steaks…a T-bone. This lovely steak is actually 2 steaks in one…a New York strip and a tenderloin, separated by the T-shaped bone which is part of the lumbar vertebrae in the cow’s spinal column. 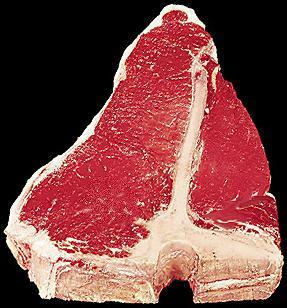 The T-bone steak and the Porterhouse steak are actually practically the same steak…but the T-bone is cut from the loin closer to the front of the cow, and the Porterhouse is cut closer to the rear. So Porterhouse steaks contain a larger ratio of tenderloin to strip, while T-bones contain a smaller tenderloin. The unfortunate consequence of this is that the tenderloin part of the T-bone tends to overcook, because it’s a smaller muscle. Porterhouses tend to have a better balance between the meat on both sides, so they’re easier to cook. Since we can already predict this episode is gonna be more about drama than cooking, let’s pause for a sec and discuss beef. There are 2 kinds of beef cuts…tender cuts and tough cuts. The tender cuts are equivalent to the white meat on a chicken: muscles that rarely get used, so they tend to be tender. On a cow, these are the muscles along the spine (or loin) that flank each side of the spinal column and never actually do much work. These cuts are renowned for tenderness…but not really much flavor. So the flavor comes from how you cook it. The tough cuts on a cow, however, are the muscles that get the actual work…the front and back legs and the abdomen. Equivalent to the dark meat on a chicken, these cuts are the ones that actually TASTE good…but because the muscles get a lot of exercise, they tend to be tougher. This is why a perfect burger will taste better than any prime tenderloin ever can…because it tastes like BEEF. Tenderloin tastes like whatever you season it with, and melts in your mouth like the butter you slather on top of it because it has very little flavor of its own. So in the quest for the perfect steak, if your primary concern is tenderness, then the T-bone is a fabulous choice…but if your primary concern is good, beefy flavor, you need to look to the tough cuts like skirt steak, flank steak, brisket, chuck roast, and round roast. These cuts need to be either barely cooked and sliced across the grain to keep them tender, or they need to be braised or smoked low and slow for an eternity to break down all the collagen and connective tissues, so they melt in your mouth. Walmart is back in the house, and you can tell how excited Joe is to be the first to talk about it. I’ve ranted enough about the Walmart-MasterChef relationship in previous blogs, so I’ll spare you. (Just be it known that I DO shop at Walmart…at least twice month. I don’t ever buy beef there. Actually, I very rarely buy beef. What I buy at Walmart are their organic products like milk and eggs…well, before I had chickens in my backyard.) I absolutely LOVE how “enthusiastic” Joe is as he reads off the cue card “Walmart sells the highest quality choice beef which is inspected by the USDA for quality.” Poor Joe, I know exactly how pissed off he was to have to say that. And, for the record, EVERY piece of beef you buy in the grocery store in this country is inspected by the USDA for quality. Again, Gordon is remarkably silent when it comes to discussing Walmart. He never says it once. Gordon says, “T-bone steak, a chef’s dream. But tonight, we wanna see this T-bone steak elevated, we do not wanna see just meat and potatoes.” When he asks Graham what he would make, Graham replies, “A simple rub, not too spicy…grill it, and with it: a potato salad.” I chuckled at that one. Exactly what Gordon said not to make. Though, honestly…if you mess with a steak too much, you detract from its beauty. Simplicity and perfection is key to presenting a great steak. Time is up, and it’s time to taste the 3 best dishes. Jordan is first, and he’s never won a mystery box challenge. Jordan has decided to separate the NY Strip and the tenderloin from the bone. (Luca also did this, but he served both steaks, Jordan only serves the Strip.) This is a puzzling choice. It certainly gives the chef better control over each piece of meat…meaning you can cook each one to perfection, which is something you CANNOT do when it’s on the bone. However, when you separate those two cuts of meat, they simply become two separate steaks. And that bone is the key to incredible flavor and juiciness. I almost never buy a roast or steak that is boneless. Wanna impress the MasterChef judges? Separate those steaks and cook each one perfectly. Wanna BLOW AWAY the MasterChef judges? Present them with a bone-in T-bone steak cooked beautifully. Because THAT is hard to do. Jordan’s steak is served with a celery root puree. If you’ve never tasted celery root…also called celeriac…you need to. It’s pretty miraculous. Like a cross between a rutabaga or turnip and celery. Bold, earthy, nutty flavor…it’s downright divine. Jordan has also made a compound butter with which to top his steak, consisting of parsley, bleu cheese, and lemon zest. (yum) He’s also got caramelized onions and fried squash breaded in parmesan cheese. The judges are very impressed with Jordan’s plate. Luca is next, and like Jordan, he has removed the bone from his steaks. But he is serving both of them. He grilled the filet and served it with haricot verts (French green beans), and roasted potatoes with Parmesan cream sauce. The NY Strip he pan seared and served with caramelized onions and a pan sauce. The judges are very impressed. The final dish comes as a surprise to some of the contestants…it’s Krissi. And boy, did she take her cooking to a whole nother level! Krissi had the balls to leave the T-bone whole. (Good girl!) She cooked it on cast iron, which she said is the way her grandfather used to cook steak. And I can’t agree with them more. There is NO better cooking method for steak than a cast iron skillet. Certainly not a grill pan, which many contestants used. (That only gives you sear on the lines where the grill pan meets the steak. That may look pretty, but you’ve only got a tenth of the flavorful crust you’d get if the whole surface of the steak was in contact with the iron.) Sometimes I’ll go for a steak grilled on charcoal, because you get some smoke in the flavor, but typically I save that for BBQ. And don’t ever EVER cook a steak on a propane grill. In fact, throw away your propane grill…it has no purpose. If you’re going to grill, you’d better do it over charcoal. Grilling on the stove is downright silly. Grilling over a propane fire is the same this as broiling, it’s just upside down. I laugh until I’m hyperventilating when I see how proud some guys are of their propane grilling skills. The propane grill is the biggest culinary scam ever inflicted upon mankind. Sell it on Craigslist. Spend 1/8 what you paid for it on a charcoal grill with cast iron grates. Your taste buds will thank you. On top of Krissi’s steak she’s got a compound butter, and she’s serving it with a crispy potato galette that she’s calling “pommes de Krissi.” I love that. A “galette” is a French style, crusty, round cake that can be either savory or sweet. “Pomme” is the French word for potato, and Krissi’s potato cake is really stunning. While the potato may be the humblest of all ingredients, cooking masterfully with it takes knowledge and incredible skill. Because starches are far more finicky than proteins. They turn to sugar at certain temperatures, and then they quickly burn. Alongside her “pommes de Krissi” she’s got a caramelized onion and Brussels sprout salad. What a dish! I would eat the heck out of that. The judges can’t praise her enough. In fact, Krissi wins the whole challenge, and while there were probably some VERY stellar dishes we never even got to see, I’d have to agree with the judges on this one, at least with reference to the other 2 plates. Krissi’s plate showed some really sophisticated technique. And while the term “sophisticated technique” tends to give me a rash, and I’m not often DYING to taste something prepared with sophisticated technique, I’d have scarfed down every morsel on that plate because it was still familiar and authentic…two adjectives sorely missing from a lot of “sophisticated” food. Back in the pantry, there are 6 massive burlap-covered boxes filled with “fresh food,” according to Joe. One by one, the burlap is lifted, revealing a variety of live birds that we use for food. The first is a quail…near and dear to the heart of every real Texan. Our very favorite game bird. Next is a pigeon, which we’ve already seen this season. Called “squab” in fancy restaurants, pigeons are basically the same thing as doves, which are also much beloved by game hunters. Graham next reveals a pheasant, which is the ultimate prize for many game bird hunters. I’ve had the pleasure of cooking wild pheasant several times…the meat is dark purple, lean, and incredibly delicious. Graham says, “If you don’t know what you’re doing with this bird, it’s impossible to nail it.” The trick to pheasant…and ALL game birds, really, is brining. They have so little fat that you need to get all the moisture you can into the meat before you cook it, to prevent it from drying out. Next is, of course, a chicken. That’s a Buff Orphington, by the way. I have one in my backyard. They are among the largest breeds of chicken, and just about the friendliest. They love to be held and petted, they’ll respond to their name, and they make a far better pet than a cat, in my most-humble opinion. Gordon pulls up his burlap to reveal a duck. A White Pekin, to be precise. This breed of duck is native to China, and for almost a century, virtually every domesticated duck eaten in the US was a direct descendent of the 9 Pekin ducks brought to New York from China in the 1800s. Ducks are one of my favorite animals…I can’t help but laugh when I see them. I had pet ducks when I was a kid, and I’ve rescued and raised MANY orphaned ducklings over the years. One year, I rescued an entire nest of ducklings whose mother had been killed by a dog. The sweltering summer heat continued to incubate the eggs and they began to hatch, but without the moisture from mama duck’s feathers, the inner membrane of the eggs had become too tough for the babies to peck through. After it became apparent that the babies would die in their shells, I reluctantly helped them hatch. We saved 4 out of the 7 quackers, and I raised them until they were fully feathered. A few trips to a local park to teach them to swim were fascinating…the ducks thought they were people and followed me around the park, terrified of the other ducks. Eventually I returned them to the pond where their mother had lived, and it was heart-wrenching to see how scared they were of the other ducks. But I had to leave them to figure it out on their own. A week later I came back to check on them, and all 4 recognized me and jumped out of the water and rushed up to me, quacking like crazy, jumping up and wanting to be held. You should have seen the look on the other ducks’ faces when those 4 were jumping up and down, wanting me to pick them up. I continued to visit them each week until the entire flock flew south for the winter. When they returned the next spring, they had their adult feathers, and I couldn’t recognize which ones were “mine.” And they didn’t recognize me, either. So my job was done, after shedding a few bittersweet tears. Krissi’s job is to assign one bird to each contestant. They head back to the kitchen for their surprise, and each bird is wearing a medallion with an image of the contestant that will have to cook it. Luca is adorably skittish of the birds, and tries to tempt his turkey with a big piece of lettuce. When Natasha picks up her pheasant, you can see a fishing line attached to it’s leg…I suppose to keep it from flying up and roosting in the ceiling of the warehouse where MasterChef is filmed. But think about it…you make tough choices in your life right now based on things you believe are right, and they make your life harder. Right? Some of you go to church on Sunday. That’s not easy. But you believe it’s right. Some of you are extremely involved with your children’s education…you personally know their teachers, you get involved with PTA. That’s not easy. Nor is it free. But you do it, because you believe it’s important. Say photography is a serious hobby of yours. Are you gonna buy the cheapest point-and-shoot that Konica makes? Of course not. So why would you always stoop to the cheapest food you can find to sustain your very life, and the lives of the people who are most important to you? Don’t you wanna know where that sh-t comes from?!? In our country we’ve been spoiled and placated into a place of blissful ignorance about how our food ends up on our table. And that’s not only gravely dangerous…it’s criminally neglectful when it comes to your kids and the people who trust you to care for them. Start thinking about where your food comes from. It is literally the MOST important decision you make on a daily basis. Yet so many of us make it so flippantly. Jessie is up first for tasting. She presents pan seared chicken breast with roasted garlic sauce, mashed potatoes, and summer veggie succotash. Joe chastises her for being too “homey” and not gourmet enough…but with all the components on her plate, it’s as sophisticated as anything anyone has cooked on this episode. He’s just sticking up his nose at Southern cuisine for being too primitive. Her chicken breast, however, is too dry. (Fancy that…a dry chicken breast! If you’re a regular reader, you know what I have to say about chicken breast. The ONLY time to eat chicken breast is when you roast a whole chicken. If you’re buying parts and you buy boneless skinless breast, I don’t know who you are. You are dead to me. At the very least, buy bone-in, skin-on breast. It’s cheaper, too.) Graham messes with her mashed potatoes, which have gone gluey. (To be fair to Jessie, they’ve probably been sitting on the plate for a couple of hours before she finally gets judged.) However, she did make mashed potatoes from red-skin potatoes, which are “waxy” potatoes and DO NOT lend themselves to a good texture when mashed. You want starchy potatoes for that, like russets, if you want them to be fluffy. The judges are not kind. And Jessie earns some Brownie points in my book for fessing up, rather than making excuses. “There’s only 6 of us cooking and you can’t get away with simple. I have no excuse.” I’ve said it before…I think we’ll be seeing Jessie on Food Network soon. She is supremely likeable. James is next, and he has duck breast rubbed with togarashi…a Japanese chili powder. He serves it with some “quick kimchee” which probably means he simmered the cabbage briefly in vinegar, rather than allowing it to ferment in a salt water brine. He’s also got ginger scallion rice and oyster mushrooms cooked in duck fat. Sounds divine, and the judges agree. Luca presents his prosciutto-wrapped turkey breast with braised Swiss chard, sweet potato puree, sauteed mushrooms, and a red wine cranberry sauce. (For the most amazing cranberry sauce recipe, click here. You’ll never go back to the can.) Joe loves it. Jordan is next, and his pan seared quail is served stew-style with root vegetables. His quail is almost raw, but he’s not familiar with cooking it. The judges are very upset. And thank you, dear Gordon Ramsay, for suggesting that he should have brined it! The top 2 dishes of the night are Bri, who celebrates with the line “Winner, winner, pigeon dinner!” *cackle* Against her as the second team captain in the next challenge will be, of course, Natasha. The edit brings us back to the first time we met Jordan during his signature dish round, where we learned that his mom had recently passed away and he’s giving it his all in her memory. Jordan is, in a sense, a perfect MasterChef contestant. He knows a lot and has incredible skill and knowledge. He is confident…but rarely cocky. I predict that Jordan will do exactly what he wants to do with his life: open a dive bar that has 5-star food. Follow Jordan on Facebook and Twitter. And comment below about what you thought of this episode, particularly if you have a fond relationship with one of the game birds that were featured! And, lucky readers, this is the LAST MasterChef blog I will write. (Perhaps ever?!?) 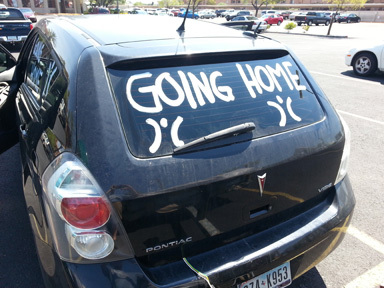 I leave Saturday for my annual pilgrimage “home” to Burning Man, and a subsequent road trip across Idaho and Wyoming and back across the Southwest. I won’t lay eyes upon a television screen for a blessed month, and it can’t come quickly enough. Good luck to whoever wins MasterChef (I know you who are!!! ), and I’ll touch base with you all on the final results in late September, but you WILL get plenty of updates from me on Facebook, and more rarely on my blog, during my great adventure to one of the most extraordinary things that happens on planet Earth.